AN early goal decided what was a war of attrition in a downpour when Dumbarton welcomed Dunfermline Athletic to the Bet Butler Stadium. 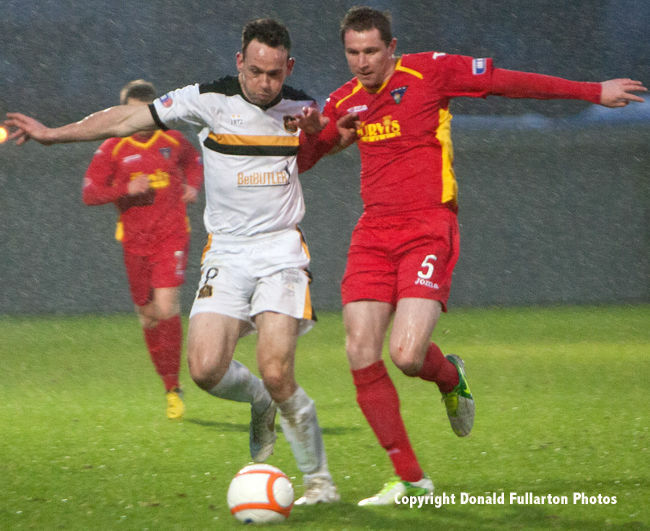 AN early goal decided what was a war of attrition in a downpour when Dumbarton welcomed Dunfermline Athletic to the Bet Butler Stadium for the first home game of 2013. A crowd of 1,050 watched a hard-fought contest, but in the end the Pars triumphed 1-0 to return to the top of the Irn-Bru Scottish League first division on goal difference. Dumbarton — fresh from away victories against Falkirk and Morton — were stunned when the visitors opened the scoring when hardly a Sons player had touched the ball. Poor defending allowed Andy Barrowman to net from just a few yards out. Ian Murray's men rallied bravely and had the better of the first half with several attempts on goal, the best chance falling to Garry Fleming but he could not quite reach it. After the break and with a gale force wind behind them the visitors mostly pinned Sons in their own half, with keeper Jamie Ewings producing some great saves. There were few chances at the other end, and the Pars took the three points from a spirited home side. The manager said: "I thought we were good in the first half and really unfortunate to be behind at half-time. But six points from three games has given us a real chance of staying up, and the boys should be proud of that." The picturen shows Sons striker Jim Lister battling with the Pars no.5.